Appreciation of The Game of Golf and it’s Fans! I so, so, respect the game of golf and the fans of the game of golf! What is required to stage any golf tournament- let alone major national championships- is much work! I’m here at the USGA Women’s Open at Lancaster Country Club as a non-playing LPGA professional golfer this time around. My perspective is much different, more broad now. When I played, I was single-minded and focused and didn’t care much to look around to see what was provided for us. Now, as an older, like I mentioned, a non-playing spectator, the bigger picture of what it takes to stage these premier golf events has me feeling so appreciative and grateful to the many, many unselfish volunteers and fans of this wonderful game. The volunteers are regular people who leave their homes and their weekly lives, travel, incur all the costs, physically work hard in the hot sun, and then sometimes have to put up with some baloney from some rude spectators to help “stage” a golf championship. There is so much to cover at an event! Committees of volunteers form teams for the many different areas that require attention. Transportation Committees: Getting players and committee heads to and from the airport and to and from hotels during the week is a full time job. Coordinating areas around the course where they can place cars and vans in the event of bad weather and evacuation is needed is another role of these committee persons. There are Rules Officials- lots of them! It is not like Wimbledon, (which is being held right now) when there is only a chair referee and a few line judges. Golf events have ACRES of land that have to be “scoured” to see how the rules of golf would be interpreted to this unique scenario. Also, rules officials have to factor in the “outside agencies” that were not supposed to be on the course in normal circumstances. For example; Large areas where “porto pottees” are placed, Huge corporate tents for hospitality out on the fairway, camera towers that are in bounds but prevent players from playing certain shots, large crowds in the way between a player and a green…. …………all these factors have to be thought out before hand and managed and it is not easy. Food: These golf events have to feed a lot of bellys! There is food that has to be cooked on site for all the fans. Where do the players eat? 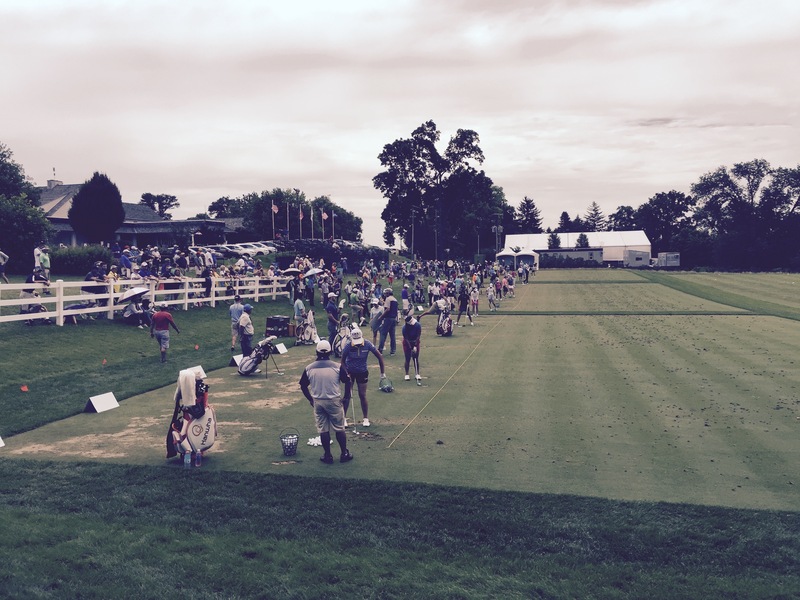 A large hospitality tent for the players and their families needs to be provided. Huge make shift kitchens are assembled and a staff of employees are supplied and they produce all this on site! Media: These days, it is a worldwide media frenzy to get the action out and broadcasted to every nook and crany in the world. There is a huge area comprised of portable tents where these journalists have access to power, computers, and wi fi. There they sit and watch TV monitors of the action and write their stories. Television: The TV Networks have to send in all their camera men- with their expensive cameras and erect towers all over the course to place the cameras at vantage points from where they can best film the action. They used to have to lug miles of cable in the old days. Parking: Hundreds of surrounding neighbors open their front yards up to park cars for the patrons who want to park close. Committees find local large shopping malls of facilities where they can easily shuttle the hundreds /thousands of fans into and out of the property to observe the action. Security: Many, Many “fans” that come in to volunteer their time, receive the assignment of handling “security.” That means, standing in the entrance gate to check to see if the incoming spectators have the correct tickets to enter. Believe me, standing at an entrance gate out in the middle of a dusty, hot, parking lot – where they can see no golf action from the players is a great service to this game! 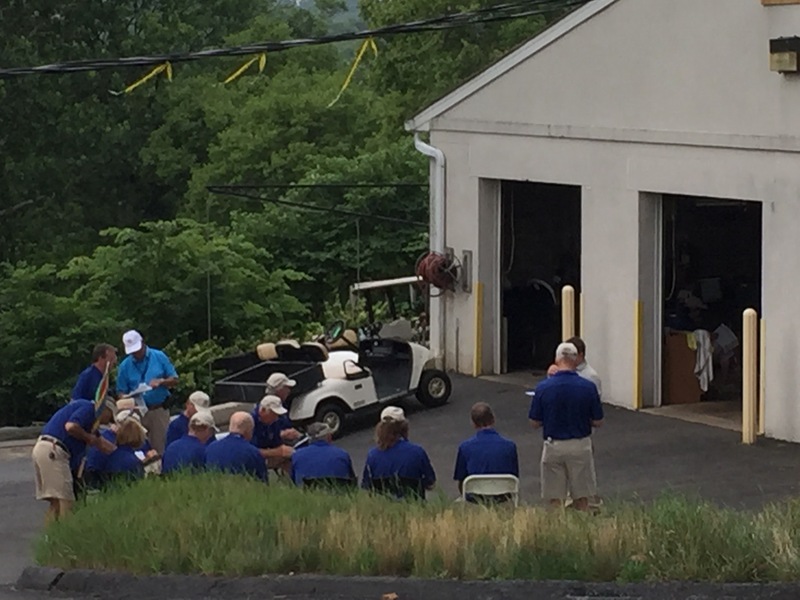 And…….there are hundreds of people who do this each week in different cities, just to help out, just to do it for golf!! It is amazing what all has to happen to have these Cities/ Courses/Clubhouses’ ready to experience the onslaught of people that particular week. Then, in a quick 7 days, it is over and you are left to pick up the pieces to a HUGE MESS- they have parked cars on your course and torn up the turf, thousands of people have stomped down the fairways and damaged your grass that will take weeks to grow back, huge holes in the ground where they dug holes to safely erect signs, or temporary tents, or camera towers……..You are just left with a mess when the last put on the 18th green is holed. Behind, every great champion of the golf event is a GREAT COMMITTEE OF VOLUNTEERS AND FANS THAT MAKE THE EVENT EVEN POSSIBLE! p.s. Photos below of rules officials being briefed VERY early in the morning before the day begins, a lone camera woman doing her daily thing of covering a player (golfers walk fast- cameramen can’t stay in the arena and just sit and shoot all day. You have to strap it on you and carry it with you! A rules official showing other officials what the official ruling would be in that area of the course. 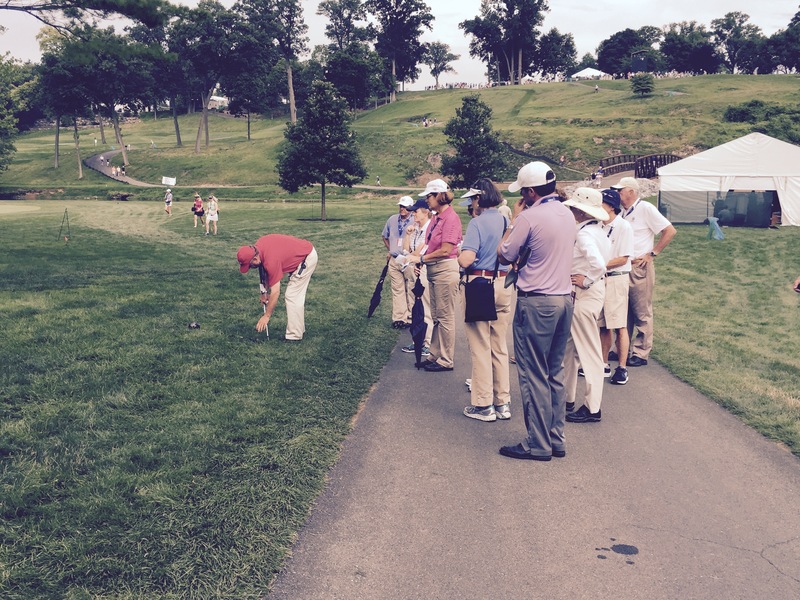 Graciously, a golfer signing autographs during the practice round to all the local young fans. (Alright ladies!! 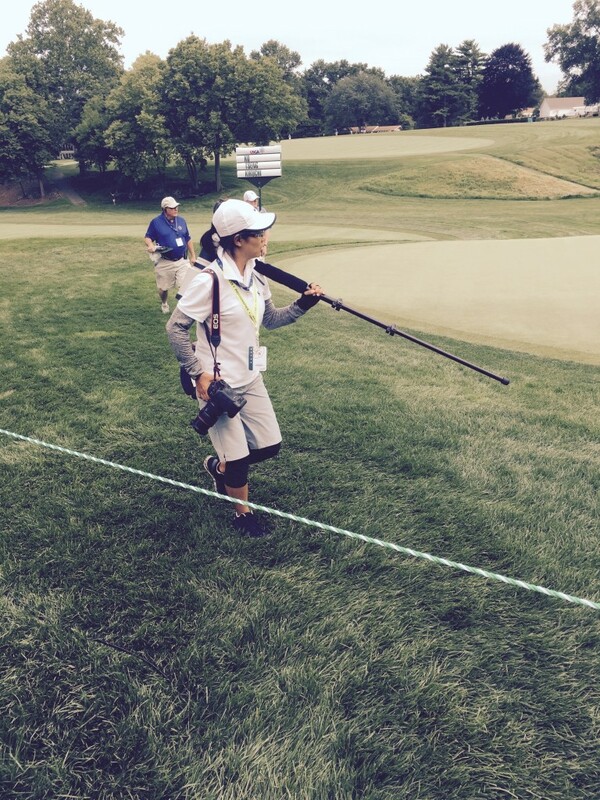 The LPGA tour is fantastic at doing this for the fans! Makes me proud!) Lastly, a whole area of your property has to be supplied to create a great practice facility for the players. Nothing to it! This entry was posted in News, Tips. Bookmark the permalink.